This is a simple and quick dish. Upkari is a traditional Mangalorean stir-fry wherein chopped vegetables are added to the seasoning and cooked and freshly grated coconut added at the end. Adding some moong dal to this recipe is a great way to increase the protein content of a dish. Moong dal cooks very quickly and also adds a great flavour to this dish. 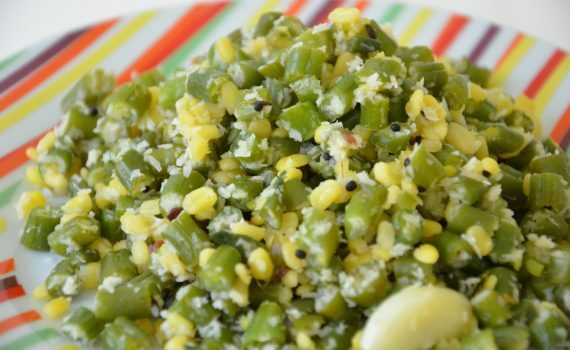 This dish is called “Beans Poriyal with Moong Dal” in Tamil Nadu. You could substitute the moong dal with sprouted whole green moong or any other cooked whole pulse (kabuli channa, lobia,etc) or even cooked channa dal. French/ Green beans are loaded with antioxidants and flavanoids. A great source of fibre, protein, vitamins A,B(including folate and Vit.B 12), and minerals like iron, calcium, manganese and potassium. Heat oil in a pan, add mustard seeds,urad dal when it splutters, add , hing, turmeric powder, curry leaves and green chilies. Add chopped beans, saute for about 5 mins, then add salt and 1/4 cup of water. Keep the flame low and cover and cook for 10 mins. Drain the moong dal and add to the green beans. Stir well and cover and cook for another 10 mins. Check if the beans are cooked, add some water if required .Try not to over cook the moong dal- it should still hold its shape and not be mashed up. Serve it as an accompaniment with rice and dal or phulkas.